Annuals for dry shade is a bit of a misnomer. First, most of them aren't true annuals—we just grow them that way. (Some will reseed themselves for next year if we let them.) More important, all plants welcome regular watering. The 10 annual flowers listed here, however, will all bloom and grow in partial shade with minimal supplemental water. With a wide range of heights and colors represented here, you should be able to find something just right to give a much-needed shot of color to that shady spot. 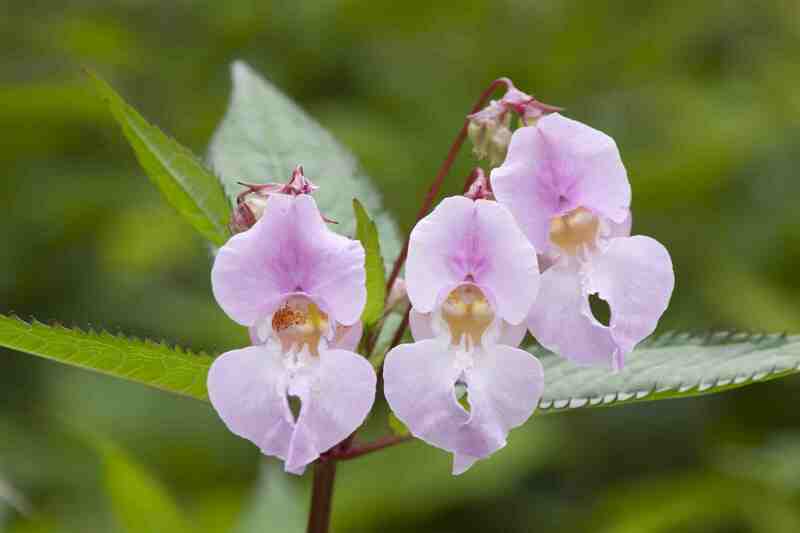 Balsam is a member of the Impatiens family, and there are annual and perennial balsams. Annual balsam is easy to grow from seed and blooms pretty much all summer. It can withstand short periods of drought but can’t stand wet feet. Balsam flowers in shades of white, pink, rose, and red and grows and blooms fine in partial shade. At 2 feet tall, it is one of the taller annuals. Drought tolerant cleome will bloom where it’s planted. In full sun, the plants can top out at more than 6 feet tall. You probably won’t get that much height in partial shade, but you will still get plenty of blooms (and, as a bonus, pollinators). There are some stunning shades of purple cleome, as well as the pink and white standbys. Cleome is a self-seeder, but it’s easy enough to pull out in the spring. English daisies are supposed to be perennial plants down to USDA Zone 4, so maybe they shouldn’t be included here, but because shady, dry growing conditions aren't ideal, they might not return next year. English daisies grow to about 12 inches tall, with pink or white blooms on top of slender, bending stems. White ones look like refined wildflowers, similar to Shasta daisies but with smaller centers. They're also shorter than Shastas. Many types of dwarf Nicotiana are available on the market, in a variety of colors, but tall, white-flowered Nicotiana sylvestris is still an attraction. If you have a good-sized spot to fill, it grows about 5 feet tall and spreads 2 feet wide. In the evening its flowers face upward and it gives off a perfumed scent to attract its favorite pollinators. It self-seeds, but in cold climates, volunteers may not be too problematic. If you live in a mild climate and don't want it to spread far and wide, keep it away from open areas, such as in the back of a border. Not all forget-me-nots are annuals, but the annual variety grows to about 6 to 12 inches tall, with the typical forget-me-not's blue flowers blooming in late spring or early summer. It may not be perennial, but it will self-seed with abandon, so expect many more plants next year unless you deadhead before the seeds form. Annual forget-me-nots prefer partial shade. Most foxgloves are biennials, growing only a low rosette of leaves the first year, then sending up a tall flower spike the second year. Knowing that gardeners are impatient people, the nursery trade kindly starts "annual" foxgloves in the fall so that they’re ready to jump right into flowering mode during their first year in our gardens. "Foxy" is the most common variety of "annual" foxglove. It’s a dwarf plant, growing about 8 to 12 inches tall and coming in shades of pink and white, with the spots and mottling you’d expect inside the glove. Impatiens are the workhorses of shade gardens. They prefer a slightly moist shade but can grow and bloom without as much water, too. Just don’t leave them on their own in a drought. Impatiens make a good indicator plant if you want a signal that it’s time to water. They will wilt and drop their blooms and then languish for a week even after you’ve watered them, but they won’t die without a fight. In partial shade, with minimal water, your impatiens will shine. Lobelia has been bred to bloom, and bloom it does. There are trailing varieties and others that grow as nice, neat mounds. The flowers are small, about a half-inch wide, but profuse. Blue lobelia is the most commonly offered, but it also comes in white and pinkish-red. Lobelia works well for baskets and along the edge of a bed. Although it is a full-sun annual, it will bloom in shade and prefers partial shade during hot, dry summers. They grow about 10 inches tall and wide. Pansies are the cool weather annual, which makes them perfect for shady gardens. Regular water will keep them blooming longer, but pansies are surprisingly tough flowers. In hot climates, they'd actually be better off in some shade, as if they get too hot, flower production will slow. You can cut them back and mulch them if your summers get really hot, to keep them going. But even if they stop blooming for a while, they’ll perk back up when conditions improve. Deadhead them to keep them blooming longer or more profusely. Sweet alyssum is underused in shady areas. The plants stay low, growing 3 to 5 inches tall, and form dense clusters of flowers in white or purple. Some varieties have a sweet scent, but you really have to get down close to tell. Sweet alyssum is extremely drought tolerant and blooms longest if you give it a good shearing in mid-summer.